About 80 equestrian trail advocates "flash mobbed at Clam Beach today," reports Uri Driscoll. 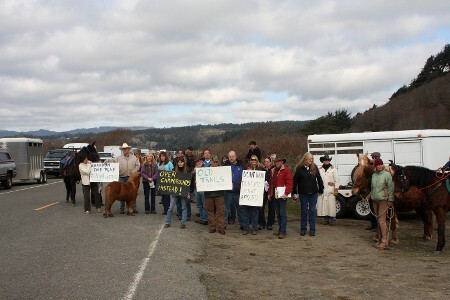 They parked about 35 horse trailers alongside the frontage road between U.S. 101 and Clam Beach/Little River State Beach, and then assembled on foot in front of them with sign boards and a petition. They demanded that Redwood State Park listen to their concerns about a trail project about to get under way along the state's Little River stretch of the long beach. "This is the area that State Parks intends to narrow by nearly half and install a two-foot wide bike lane and a horse trail alongside the remaining asphalt," said Driscoll in an email following the action. According to the equestrians, there's a perfectly good horse trail they've already been using, and would like to keep using; they don't want the new trail the state proposes to build -- so why spend scarce state money on it? Driscoll says they invited State Parks officials to come to the action and accept their petition with about 200 signatures, but received no response. The trail project is part of a long-term native dune habitat restoration project in the area. "We the undersigned are asking California State Parks to add equestrian designation to the proposed pedestrian trails at the Little River State Beach project site. These existing trails have been acknowledged to have shared use for decades and there has been no data presented to justify the elimination of such historic use. "We also asked State Parks to consider scaling back the proposed equestrian trail project that would unnecessarily cut into undisturbed habitat. The existing trails if designated for horses would be adequate for continued use. "A modification of the trail plan submitted to the State Coastal Commission to this end would be supported by the equestrian community.